A preeminent hostess and tastemaker invites you to the most chic at-home parties, with detailed descriptions for invitations, flowers, table settings, linens, and more than eighty original recipes. 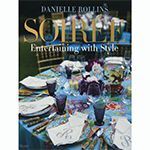 Veranda calls Danielle Rollins a "genuine expert—a natural-born entertainer," and in her first book Rollins invites readers into her world of elegant, accomplished entertaining. Featuring events both intimate (a New Year’s Eve dinner) and grand (a fund-raiser), all fifteen parties emphasize hosting guests with grace and ease at home. The reader will learn how to create a party timeline, how invitations set the tone, and how to plan a menu and gain dozens of ideas for setting festive tables. From signature cocktails (Blood Orange Old Fashioneds, Prosecco with Popsicles) to the imaginative linens, flowers, and menus, Rollins brilliantly executes every detail. From croquet in the garden at the Gatsby Lawn Party (St. Germain Lemonade Cocktails and Victorian Iced Sorbet, with guests in period attire) to a Fall Harvest Chef’s Dinner in the Kitchen, with guests seated cozily around the kitchen island, eating Pork Chops with Stone Ground Grits, the parties are cleverly conceived, flawlessly executed, and fun. Handsomely photographed and filled with the parties of tastemakers such as Oscar de la Renta and Lela Rose plus recipes by esteemed guest chefs, Soirée is an idea-filled resource for those who love to entertain. A contributing editor to Veranda and Southern Living and lifestyle editor for the online magazine LuxeCrush, Danielle Rollins is a tastemaker and trained chef. The cofounder and chair of several charities, she lives in Atlanta.